I don’t often do book reviews. It’s not that I don’t like it. Quite the contrary. I love cookbooks. As you’ll probably have guessed…. Whenever I walk inside a bookstore, the travel and food sections are the ones where I spend long stretches of time. Typically, I find a spot in a corner where I sit on the floor and make myself comfortable. In front of me, there’s a pile of cookbooks. With travel books. 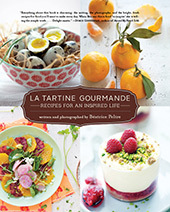 I flip through the pages in search of beautiful photographs of food and places to visit. I wish for inspiration. Most of the time, I find it. And I leave refreshed and energized with new ideas. So yes. To my regret, I don’t talk a lot about the cookbooks I enjoy reading. Only because I am always short of time. Lulu, work–and life generally speaking–keep me too busy. Like all of us. But after I received a week ago my copy of Heidi’s new cookbook, Super Natural Every Day, I decided that I’d take the opportunity to change this fact. The truth is that talking more about cookbooks has been on my to-do-list for a while. With this new beautiful book of hers, the timing was right. So I grabbed it. Have you seen Heidi’s book too? Read it? Cooked from it? Of course, right away, the photographs were what drew me in. Authentic. Real. They had me dream of traveling to the west coast. They had me dream of someone else’s healthy food. It’s a nice feeling to experience, really. Over the last two weeks, I have not had yet much time to explore the book in depth. But I know I will. Heidi’s book–vegetarian–is full of many of the every day foods I love to prepare and eat: Quinoa, vegetables, whole grains, nuts and fruit are cleverly used into healthy nourishing dishes. 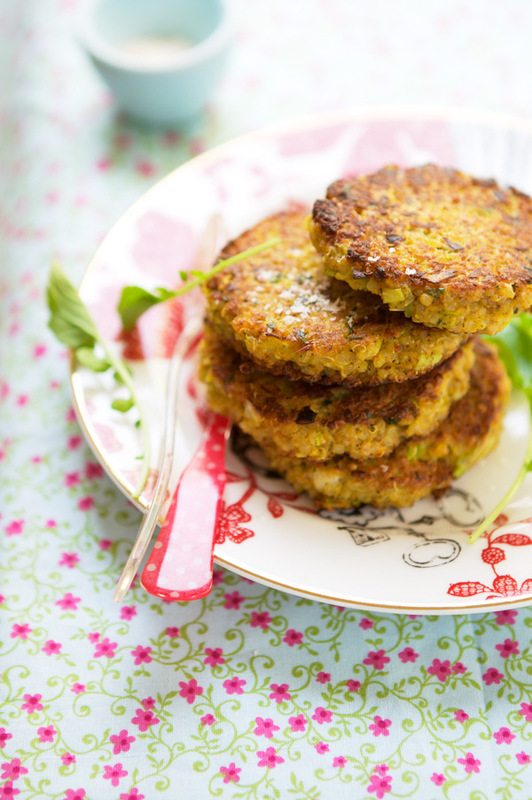 So far, I’ve cooked Heidi’s quinoa patties–something I myself cook often as all of us in the family, Lulu including, love quinoa under any form. I adapted the recipe slightly with what I had handy and the patties turned out delicious. Next, I baked a gluten-free version of her plum and buttermilk cake. Because I loved the picture that illustrated the recipe. And I am a lover of the cheerful color and taste of plums. All of them. That day, delicious food followed by a walk to with Lulu made our day. There was real Spring magic outside. And we filled our senses with every bit of it. Thank you Heidi for just the right amount of inspiration! Your book is truly beautiful. 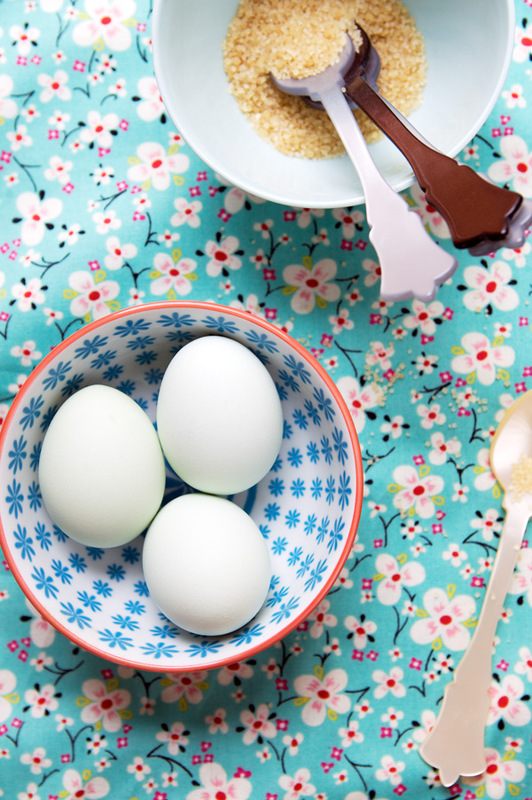 Combine the quinoa, eggs, and salt in a medium bowl. Stir in the chives, onion, cheese, and garlic. Add the bread crumbs, stir, and let sit for a few minutes so the crumbs can absorb some of the moisture. At this point, you should have a mixture you can easily form into twelve 1-inch / 2.5cm thick patties. I err on the very moist side because it makes for a not-overly-dry patty, but you can add more bread crumbs, a bit at a time, to firm up the mixture, if need be. Conversely, a bit more beaten egg or water can be used to moisten the mixture. Heat the oil in a large, heavy skillet over medium-low heat, add 6 patties, if they’ll fit with some room between each, cover, and cook for 7 to 10 minutes, until the bottoms are deeply browned. Turn up the heat if there is no browning after 10 minutes and continue to cook until the patties are browned. Carefully flip the patties with a spatula and cook the second sides for 7 minutes, or until golden. Remove from the skillet and cool on a wire rack while you cook the remaining patties. Alternatively, the quinoa mixture keeps nicely in the refrigerator for a few days; you can cook patties to order, if you prefer. Preheat the oven to 400°F / 205°C with a rack in the top third of the oven. Butter and flour an 11-inch (28 cm) round tart/quiche pan, or line the bottom of the pan with parchment paper. Alternatively, you can make this cake in a 9 by 13-inch (23 by 33 cm) rectangular baking dish; just keep a close eye on it near the end of the baking time. Whisk together the flour, baking powder, fine-grain sugar, and salt in a large bowl. In a separate smaller bowl, whisk together the eggs and buttermilk. Whisk in the melted (but not hot) butter and the lemon zest. Add the buttermilk mixture to the flour mixture and stir briefly, until just combined. Spoon the batter into the prepared pan, pushing it out toward the edges a bit. 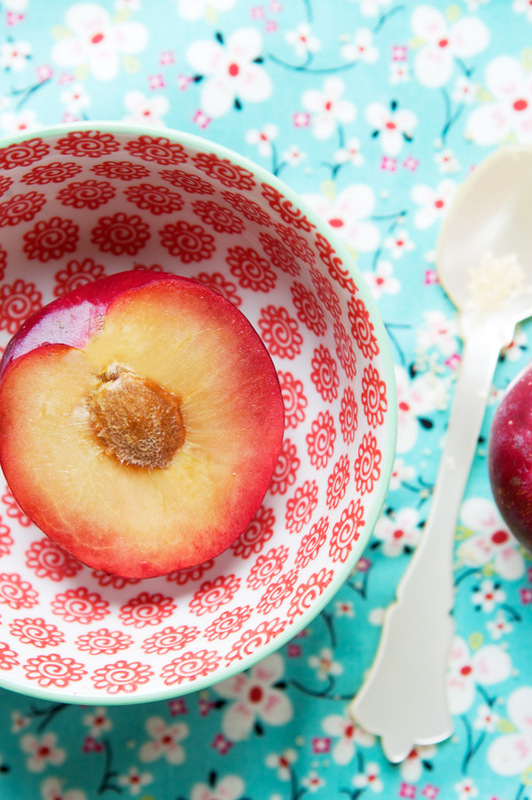 Scatter the plums across the top, then sprinkle with the large-grain sugar. Bake for 20 to 25 minutes, or until the cake has set. A toothpick to the center should come out clean. Serve warm or at room temperature. Recipes in Heidi’s Super Natural Every Day book, reprinted here with the permission of Ten Speed Press. Commandé cette semaine, j’espère le recevoir très vite, ce livre a l’air fantastique! The plum cake looks very homely. I have never tried gluten free flours but have been meaning to make a plum cake for a while. So may try it with white flour instead! Your spring photos are wonderful- looks like you live on a little piece of heaven! And if you ever see someone sitting in a bookshop with food magazines sprawled around…it’s me!! I was lucky enough to receive her book as a birthday present a few weeks back, and I’ve been enjoying it as well. Her recipes sounds wonderfully delicious, but have also been a sort of inspiration to wander off and try things with mung beans, and even popcorn. 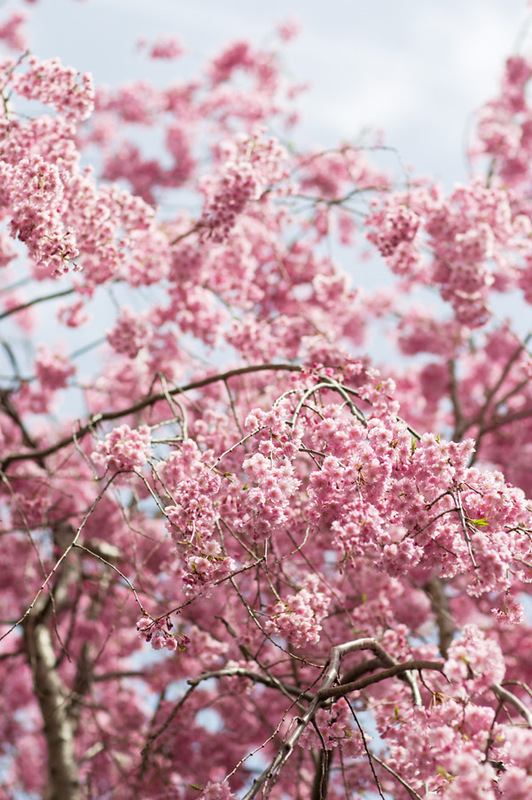 Your photos of blossoming springtime are absolutely lovely. It’s so nice to see spring after such a harsh winter. All your photos are so beautiful, as always, but the one of the quinoa galettes is my favourite. Now that I finally found quinoa I will try your recipe and hope they will turn out as nice as yours. 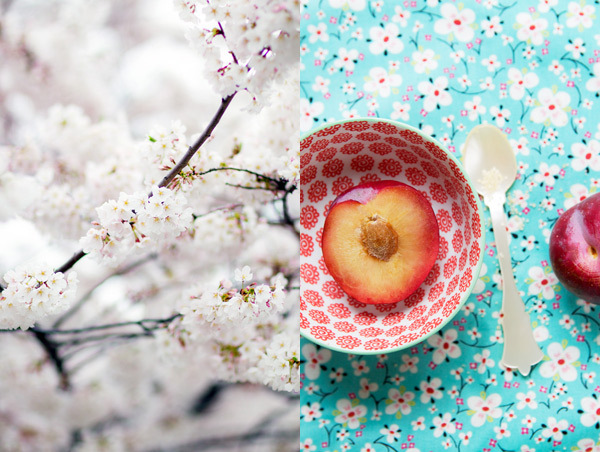 Your photos of blossoms are lovely with the fabrics you chose. What colors! 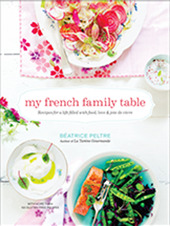 I have Heidi’s first cookbook and her latest is on my wish list. Maybe for Mother’s day? 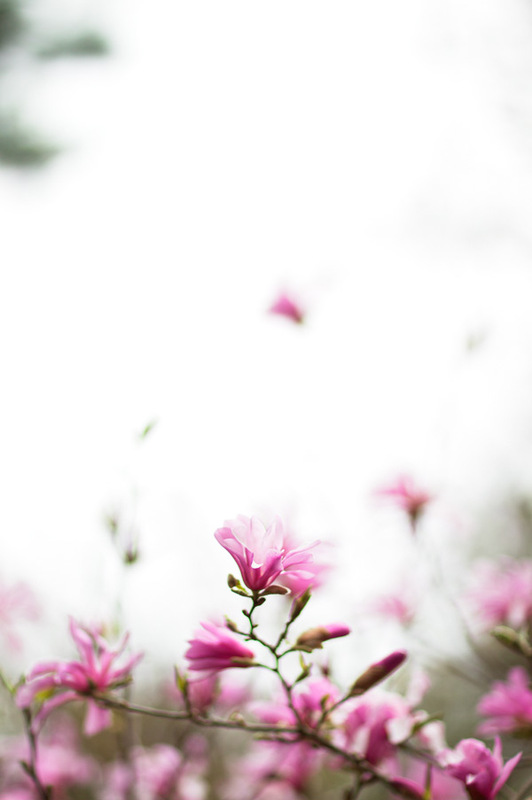 So glad you have Spring at last, the pink blossoms are breathtaking and beautifully pared with your lovely fabrics. Your pictures make me happy. Gluttonforlife, I used a combination of millet, quinoa, amaranth and cornstarch. And GF bread that I pulsed into crumbs. It’s virtually pointless for me to continue gloating over your stunning photography. So, I’ll just dig into the rest of the post, which so wonderfully describes this book and how inspirational it is. It’s fantastic that you’ve had a chance to do a few recipes from it. I really need to buckle down and try a few more out. Maybe i’ll just start with those mouth watering quinoa patties. Ce livre est pour sûr un must-have. Bonne chance pour le Saveur’s food blog award et joyeux anniversiare à toi ! 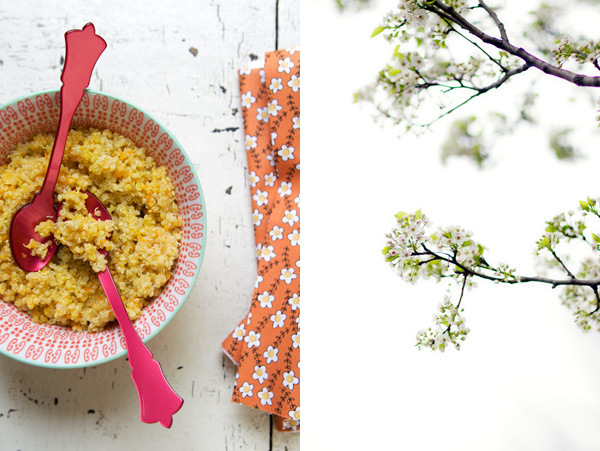 Thanks so much for the quinoa recipe…..something I love but have not yet mastered! And, Heidi’s new book is definitely on my list for Barnes and Noble! Not so much in the vein of this particular article, but more in the spirit of our love for amazing food. so funny, I got her book only yesterday and we just had heidi’s squash and coconut soup for dinner (and the kids loved it too, hurray). 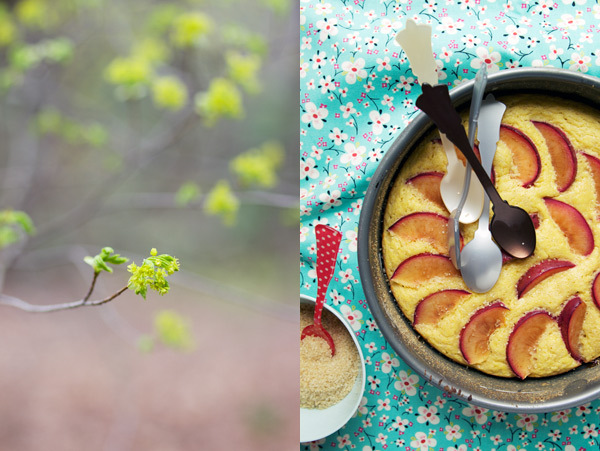 I love these coincidences – and now we have to wait for some nice plums to arrive at these shores (London that is), to make the buttermilk cake! 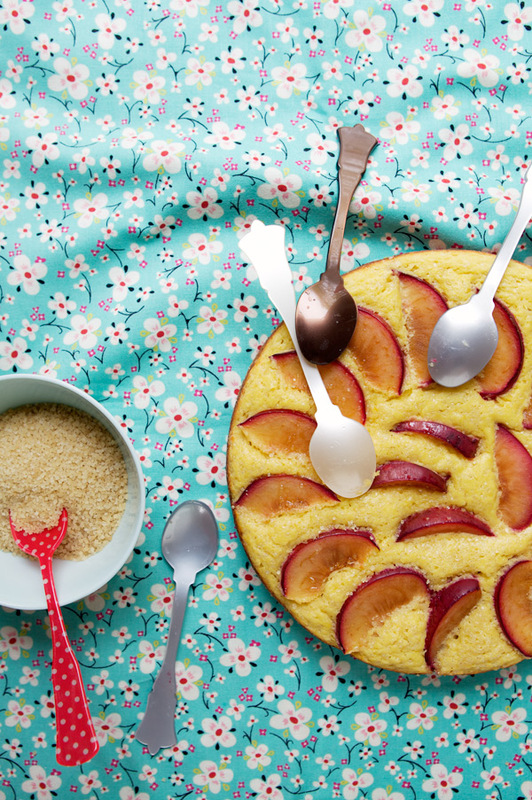 What a great recipe for the Plum and Buttermilk Cake!!! We love quinoa in our family. It’s nutty and flavorful and delicious. Thanks for the patty recipe! Looks yummy! I have Heidi’s first book and have loved it! I plan to order this one too 🙂 I love making recipes from both of you! Your blog is incredible and your photos impossibly perfect. First, I drool then, I take notes. I’m new to food blogging – so I am super glad to have found your site! oh how i wished you posted the gluten free version of the cake! il est très bon site et j’aime beaucoup. Thanks Bea! I’ve made gluten free versions of the quinoa patties and a number of Heidi’s muffins in the new cookbook but wasn’t ready to tackle experimenting with the plum cake. Would you mind sharing the ratio of flours to cornstarch? I’m still struggling with achieving a light moist gluten free version that doesn’t dry out by the next day! merci pour ces recettes ! peut-on trouver en France du “buttermilk” ? ou par quoi peut-on remplacer s’il te plaît ? merci ! Such beautiful photos! 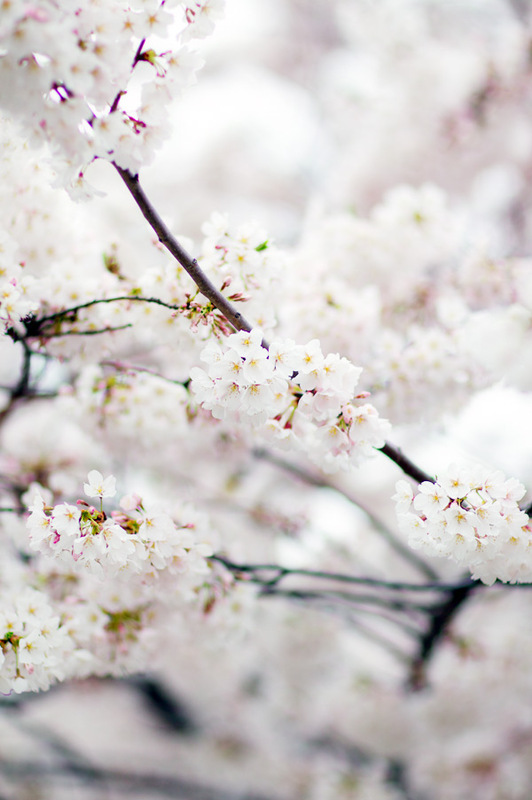 I’m very jealous of all the spring blossoms you seem to have all around you. I’m also very jealous that you have Heidi’s book! Everyone has been talking about it and I’m definitely going to have to get it now too! Thanks for a gorgeous post Béa. Superbe! Ce livre me plait aussi beaucoup, il faudra que je me le procure parce que moi aussi j’aime les feuilleter, ça fait rêver je trouve. Les photos de la recette me font aussi rêver! Congratulations!!! I love it every recipe taht you create, are so delicious!! Ooo your quinoa patties look soo good! I’ll definitely have to try them out! What kind of camera are you using? Your pixs are always GORGEOUS. 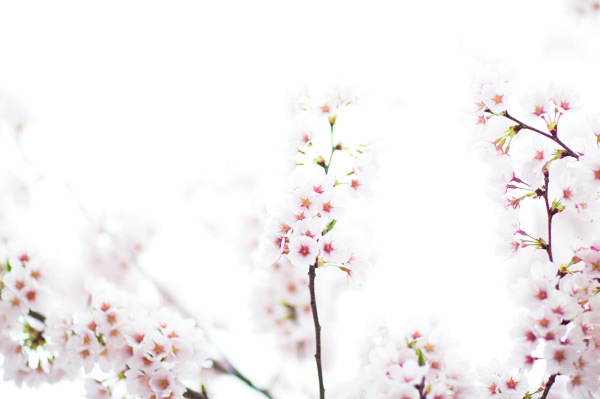 Bright, clear, crisp……love looking at your blog just for the photos alone. Please don’t tell me you have a degree in photography. I will just give up now on taking photos. I need a new camera and would love to know what you are using in case it’s something I could actually learn to use! Thanks for the cookbook recommendation! The plum cake is lovely and I love quinoa cakes. Lovely post! J’ai teste les galettes au quinoa hier soir et c’etait une reussite. Petite variation avec ce qu’on avait a la maison, Je n’ai mis qu’un demi oignon ce qui etait suffisant pour moi, un oignon nouveau et es herbes du jardin et nous nous sommes régalés. A refaire. I think I’ve never seen any cookbook which has received such an amount of attention among food bloggers. It seems like everyone is doing a review on Heidi’s book. I don’t have the book – yet. I just checked if I can order it from my local bookstore and it seems like they will get it in store in the next couple of weeks. Excited! I’ve been out of commission for a while, but when I look at blogs like yours, with photography that makes me want to bite the computer screen, it inspires me to keep on. I’ve just made the cake and it was absolutely delicious. I used white flour and it came out fine. However I think something is wrong with the number of plums, or else I messed up somehow. I used a lot less. Other than that, I think this is my first comment, by congratulations on a fantastic blog! i received heidi’s cookbook a few weeks ago, and i have just loved all of the inspiration ive gained from it! i cant wait to try this cake…i love sweet but not cloyingly so, and this looks just so divine in your pictures. i love it! thank you. i have those same bowls from anthro! Quinua is one of the most amazing grains in the whole world, and if cooked properly, really yummy!! Heidi´s book is gorgeous, and your description of it only makes it better. Thanks. Si vous êtes intéressées par les couverts, ils sont en vente chez sabre.fr. et 2 magasins à Paris dont un nouveau quartier de la Madeleine. J’en ai, ils sont craquants ! Merci encore pour ce sublime blog ! Bye. I’m enjoying Heidi’s latest book so much too! The millet muffins, oat cakes, and prune oatmeal are staples already around here. I need to brush up on my desserts this is one I am going to have on my menu and for trainees I think. Thank you. love this site, only just found it. Vos photos et vos recettes sont toujours aussi sublimes! Je viens de tester la recette du gateau mais suis quelque peu déçue par celui-ci. Il est très compact… Comme si il y avait trop de farine?! Pouvez-vous m’aider? Malheureusement, comme indiqué dans le billet, cette recette n’est pas la mienne. Peut-être cela est dû à la méthode ? Bonjour, cher ami, vous remercie pour le partage. I have bought Heidi Swanson’s book a few months ago, and I love it. So far I have tried (and repeated!) Weeknight curry, Chickpeas with Dandelion Greens, Avocado with Mustard seeds (I LOVE IT!) and Tutti Frutti Crumble (Yummy! ), etc. Your blog is great, too and I am looking forward to try your recipes as well. Greetings from an Italian in Maine!